真的會很氣 但Mrs T 請不要生氣 not worth it! [版主回覆05/24/2013 17:30:42]唔係嬲，不過已經發生過好多次，仍然有人大搖大擺咁做，只係間中有少少沮喪......anyway thank you Cwai! [版主回覆05/24/2013 17:29:32]Thank you very much Polly! totally understand how yuou feel, even I feel angry for you. Ignore these kind of people, we always support you and thank for your sharing so that we can make delicious food too. 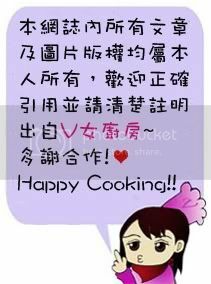 [版主回覆05/24/2013 17:29:09]Thank you very much for your support mummy of two! 多謝緊張大師支持 + 捧場! 我會繼續加油，唔會因為依一小撮自私唔自律既人而放棄~ 我有時間都會去探妳架! [版主回覆05/24/2013 17:25:54]Thank you 緊張大師~ 其實以前都發生過好多次架嘞! 我唔知就無得好講，我知道既話一定會出聲囉! 如果對方死撐同我拗唔認抄野，我反而覺得佢有guts喎，我好聲好氣問佢佢當我透明，再問佢就加返註明但依然當我透明....咁即係點? 又要影相又要打字, 嘔心瀝血先逗到個POST出黎, 比呢D文盲一個唔該都無就COPY晒真係勁嬲LOR! !但機會最多只可比一次, 下次佢再COPY一定要檢舉!不過咁, 又唔好因為呢D文盲影響自己心情, 掉轉唸因為自己D係好野先有人COPY, 咁就會開心D啦^^而事實上你D 野係好正LOR! [版主回覆05/24/2013 17:20:02]多謝 + 過獎Mary! 我唔知就無得好講，但我知道的話一定會出聲! [版主回覆05/24/2013 16:59:02]Thank you Double Iron Legs! [版主回覆05/24/2013 17:37:55]Thank you for your support TAM! I read your blog almost everyday, and I told my hubby about how amazing you are!! You know, many people don't know the meaning of respect, they are just living in their own little world. Anyway, don't let them ruin your mood!! Hope you & Mr. T have a nice long weekend!! [版主回覆05/25/2013 03:13:40]Hello another Mrs.T! long time no see, how are you? support 你ga!! 因為lee d 人真係好無品!!! 我覺得如果你發現個個人再係gum 真係要檢舉!!! [版主回覆05/27/2013 20:41:33]Thank you Kelly! 我同佢講咗2次佢先肯改，又完全當我透明唔蘇我，若佢仲有下次，我緊係無咁好氣再同佢咁客氣! 即時檢舉!! [版主回覆06/08/2013 08:40:42]Thank you Ann Ann! 放得出來無錯係公開，但佢要轉貼點解要copy & paste當係自己野? 連改吓文字都懶得，咁我寧願認自己小家咯~ 總之係唔比佢抄呀吹咩?